Are you planning a romantic getaway for your honeymoon or anniversary? Coconut Condos can provide you with our special Romance Package which includes a dozen roses in a glass vase, rose petals spread on the bed, a bottle of champagne, two champagne glasses, and a box of Hawaiian chocolates. 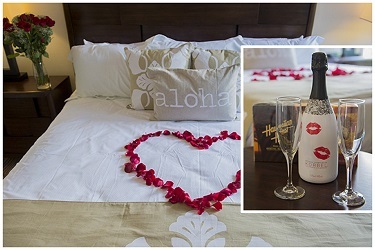 A great way to sweep that special someone off of their feet during your stay here on the beautiful island of Maui. Here at Coconut Condos, we always want our guests to feel the aloha spirit. 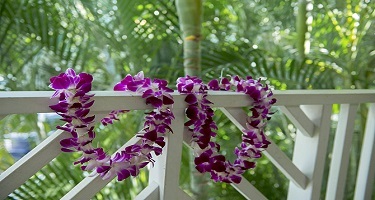 What better way to greet your family or friends than with a beautiful orchid lei upon their arrival to their condo? The lei(s) will be placed in the fridge prior to arrival. 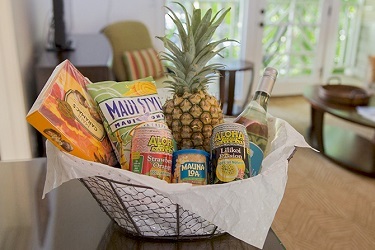 Celebrate your special occasion in Maui with our local Maui gift basket.This includes a bottle of wine, a pineapple, two Aloha Juices, an 8 oz can of macadamia nuts, a box of Hawaiian chocolates, Maui style chips, and microwaveable popcorn. Such a great way to start your vacation or celebrate a birthday. This basket will be waiting for you in your condo upon arrival. 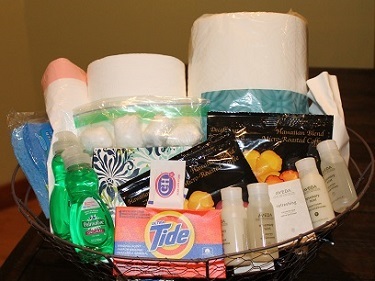 We provide our guests enough amenities to get started for their stay; however, if you require additional items, you may purchase our amenity basket. This includes a single use laundry detergent box, two shampoos, two conditioners, two bar soaps, three trash bags, five dishwasher pods, dish soap, a dish sponge, three toilet paper rolls, two tissue boxes, paper towels, and two regular and decaf coffee packets. If you would like your unit to be cleaned and your linens refreshed along with these items, please feel free to inquire about our mid-stay clean for an additional fee. Coconut Condos partners with CSA Travel Protection to provide optional coverage for our guests. Travel insurance can be purchased at any time up to 30 days prior to your arrival date. CSA provides trip cancelation and interruption services, as well as emergency assistance and travel services, covering financial losses. Click here to sign up for travel protection.